The Video CD Card, called the Movie Card (ムービーカード) in Japan, is a daughtercard-like peripheral that plugs into the Sega Saturn (though the door the battery is accessed from), and, as the name suggests, allows the Saturn to play Video CDs (VCDs), otherwise known as the White Book disc standard. The Video CD Card also allows the hardware playback of MPEG-1 (version 1) video in certain games, leading to higher quality full motion video for use in cutscenes (and occasionally, gameplay). The Video CD Card was released seven months after the console's debut in Japan. Nevertheless, the Video CD card stands as one of the earliest attempts at transforming a system traditionally used for games into something more akin to a general entertainment device. It was released in Japan and Europe and variants were manufactured by Sega, Victor, and Hitachi. 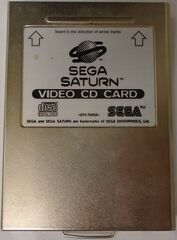 Many cards are also capable of handling the rarely seen Photo CDs (or Beige Book disc standard), and there have also been reports of Saturn third-party video CD cards. With the Photo CD and Video CD standards only being finalised in 1992 and 1993 respectively, the formats were still relatively new when the Saturn was released, and similar to the relationship with the Xbox 360 and HD-DVD standard, and PlayStation 3 and Blu-Ray standard seen in later generations, for a short while the Saturn became a spokesperson for the two technologies, attempting to persuade consumers to switch from analogue systems such as VHS. In Japan, the Movie Card was launched alongside the Photo CD Operating System and Electronic Book Operator on 23 June 1995 and retailed for ¥19,800. Europe received a similar package, save for the Electronic Book Operator shortly afterwards. The card fits in all versions of the Japanese Saturn (the Hi-Saturn naturally comes with MPEG capability), with early Japanese Saturns (i.e. the gray ones) having the connector for it on a second circuit board inside the unit, and later ones having the connector on the main board. Despite not being sold in the North America, all variants of the Video CD Card should work in a US Saturn, but the system's language may need to be changed. For various reasons, most notably the lack of copy protection, the Video CD format failed to take off in Japan, and despite early pushes, was also rejected in Europe. Though the VCD format made it to North America, the Saturn's Video CD Card did not, and all three regions stuck dismissed the concept in favour of earlier technologies, usually treating the Saturn purely as a video game console. By 1995 the DVD standard had been created, and became the dominant form of video media during the late 1990s and 2000s (something the PlayStation 2 greatly benefited from). The Photo CD standard, though initially popular, became a loss-making venture and was retired between 2001 and 2004. VCDs, however, remained popular in smaller Asian markets, such as mainland China, Taiwan, Hong Kong, Singapore, Malaysia, Thailand, Burma, Indonesia, Philippines, Vietnam, India, Pakistan and Bangladesh. For this reason, VCD compatibility was given to some Asian Sega Saturns straight out of the box. Sony also produced VCD-compatible PlayStations with the model number SCPH-5903 (with third-party accessories giving standard PlayStations VCD support). Primarily the Video CD Card is used by Saturn enthusiasts to upgrade the quality of in-game movies. VCD resolution is 352x288 for PAL and 352x240 for NTSC. The Saturn does not support the extensions to the standard, namely the SVCD or XVCD technologies. Several variants of the Video CD Card exist, with the primary differences being native Photo CD capability (or the lack of) and whether the television technology used is NTSC or PAL. For cards which lack native Photo CD support, the alternative for reading Photo CDs is to use the Photo CD Operator, however this requires disc-swapping. The EU MK-80310 Video CD Card is incompatible with all of these games. The US version of Gungriffon still has MPEG movies on the disc but that they are not played during the game. Instead, the in-game movies have been apparently converted to Cinepak or Truemotion. Main article: Video CD Card/Magazine articles.